I’ve always enjoyed keeping fit, especially running and cycling. I ran a marathon in June 2005, six months before my MS diagnosis (which at least explained why I’d started falling over when running!). But 11 years on I have secondary progressive MS and my mobility has deteriorated a lot. I miss running and I badly missed my bike when I could no longer balance well enough to cycle. Pain is also a huge issue for me. I really want to stay active, mainly because it makes me feel so much better in myself but I’m also aware that putting on weight could make walking even more difficult than it is now. Last year a friend suggested we try a tandem as the person at the front can balance for both riders. My husband, John, googled and found the charity Charlotte’s Tandems who loan tandems free-of-charge to people with disabilities. We borrowed our first tandem for two months and took to it really well. John gets on first at the front - the pilot, then I get on at the back – the stoker. I have shoes that clip on to the pedals to keep my feet in place and I stay clipped on at junctions, relying on John to put his feet down and hold the bike steady. There is a lot of trust involved. We enjoyed the tandem so much that we bought one of our own. Ours cost about £2,500, but you can get them cheaper. We did have to buy a bigger shed though. Things escalated quite quickly! We’re very lucky living in Somerset because there’s so much beautiful countryside away from busy roads. We usually cycle at a comfortable 10mph (as long as not too hilly!) for about an hour at a time. Much longer and my legs give up, leaving John pulling more than his share of the load. At least my legs are still going round, even if power-assisted by John. There’s a well-worn joke you hear all the time, people shout ‘Hey! She’s not pedalling at the back!’. You hear it so often it’s just not funny any more, although in our case, it is sometimes partly true. I was worried I might be overdoing it by exercising to the point where my legs fail, but my MS physio reassured me it was fine saying ‘you either use it or lose it with MS’. My MS team at Southmead hospital in Bristol are brilliant like that, really encouraging and supportive about staying active. You feel so much better during and after exercise, getting your heartrate going and endorphins flowing. I also swim and practice yoga, but nothing beats getting outside with the fresh air on your face keeping you cool on summer days. Last year we cycled the Trans Pennine Trail from Leeds to Manchester with our daughter and her boyfriend, 100 miles over four days. It almost went wrong though, we took the tandem by train from Taunton to Leeds and nearly got thrown off at Birmingham as the train operator did not allow tandems! 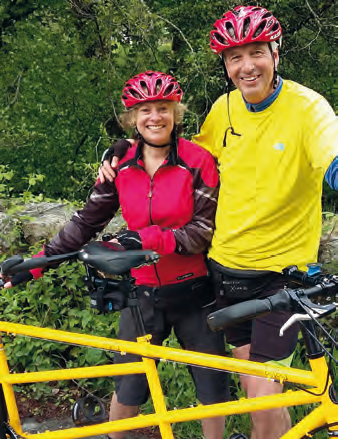 We had to hastily re-plan our return trip from Manchester to route via London Euston, involving a tandem ride through central London to Paddington, before returning to Somerset. We belong to the Tandem Club and cycle with our local group once a month. We’re not fast and furious road cyclists, in fact most of us confess to cycling in order to earn a guilt-free cake during stops! This summer we’re going to the Tandem Club national rally in Northumberland, involving more train travel and another trip across London. This summer we hope to meet up with Justin Kendall who has secondary progressive MS and is cycling from Snowden to the Pyrenees to raise funds for the MS Trust. We hope to accompany him for part of his journey across Wiltshire. It should be a great demonstration that having MS doesn’t have to mean you have to stop being active. And that you don’t have to be a Paralympian to do it! This story is part of the August 2016 issue of our free quarterly newsletter Open Door. Sign up for your free subscription!